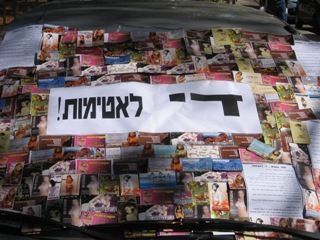 The pre-Purim shopping procession along King George Street last Friday was impeded by a car parked in the middle of the sidewalk in front of Gan Meir Park; its windows completely covered with cards advertising the services of artificially posed women with airbrushed smiles. “We wanted to get in people’s way,” said Gili Asher, “we put the car on the sidewalk so that people couldn’t avoid seeing it.” Asher and Ofra Segoli, both third year students in the School of Social Work at Tel Aviv University, set up the car to protest against trafficking in women. The project originated as an assignment for “Art and Activism”, a course taught by Rimona Lappin in the Theatre Arts Department. “We knew we wanted to address the issue of trafficking in women. As someone who lives in Tel Aviv with a car, I walk out each morning to find these cards on my windshield,” Asher, “most people end up throwing them on the sidewalk, so it’s also an environmental issue.” Another disturbing aspect of this phenomenon was discussed by Meirav Shlomo on Ynet (http://www.mynet.co.il/articles/0,7340,L-3622662,00.html) – young children have begun collecting these cards from the streets, playing with them and trading them like baseball cards. Segoli and Asher wanted to call attention to the problem and decided to use the car itself as illustration, plastering and effectively sealing its windows with the cards. “People remain sealed off; oblivious…we wanted to remind them that there is a woman, a story behind the picture.” Flyers calling for “An End to Apathy” provided the grim statistics (14 is the average age of someone entering prostitution, between 75% – 90% of prostitutes were sexually abused as children) and offered some suggestions for further action, such as volunteering at organizations that provide a hotline for prostitutes. For more information: kav.siyua@gmail.com.